…and Gilly thought the ducky was even more so! Rose put water in the basin so Gilly could play!! Our Hitty friend Penny sent Rose’s crochet finery, some lace, buttons and ceramics for the Hitty cupboard, wee tiny animals especially for Gilly, and two little balls of cat-yarn, one tortoiseshell and the other grey tabby! We predict more Hitty-kitty-knitting as well as general fun! Thank you so much! Hitty friends are some of my favourite people…and the Quimper Hitty’s favourites too! We so pleased, the parcel put smiles on the faces of all of us! What a generous and kind gift from Penny. And, thanks for your generosity in sharing the fun with us. Generosity seems to bubble up whenever I interact with Hitty friends, we are so lucky!. Love this soft pink color…what a nice and pretty surprise. Rose is extremely pleased, she says it feels as if the combinations and shawl were made especially for her! Oh what a fun packet! I have received the gift of Penny’s needlework and can attest to her skill and creativity. Love those combinations and that dainty shawl, such a pretty soft color. 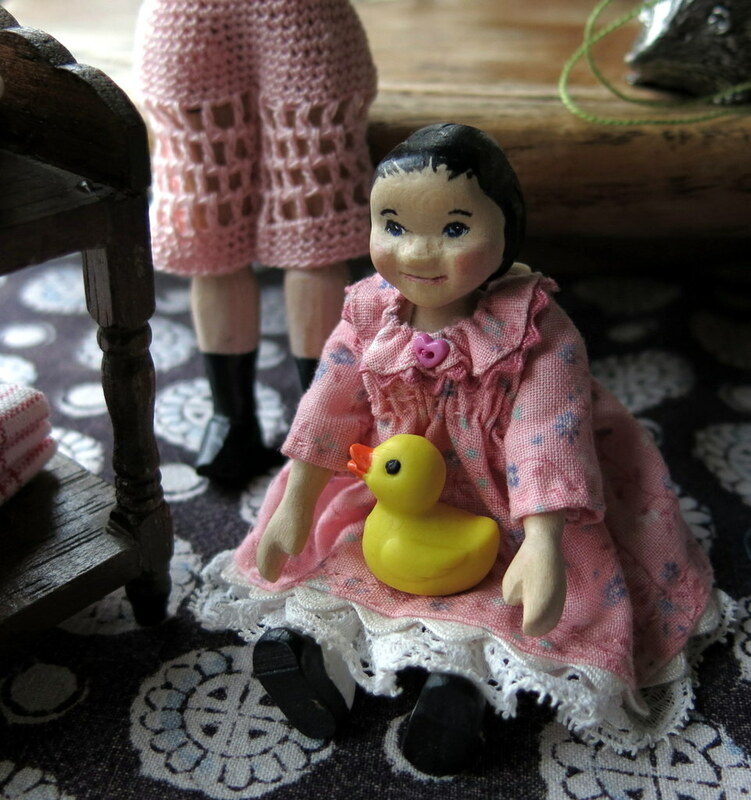 The photo of Gilly with her duckie and the basin of water…too cute!!! what a happy day at the Quimper cupboard. It was a happy day! Gilly was excited by all the little animals in the packet, but fell immediately in love with the ducky! We also feel Penny is a genius with yarn, and we are everlastingly grateful!